I get a lot of questions from people asking how they can get a bar to be on Bar Rescue, so I figured I would do a post to let everyone know that Bar Rescue is currently casting. 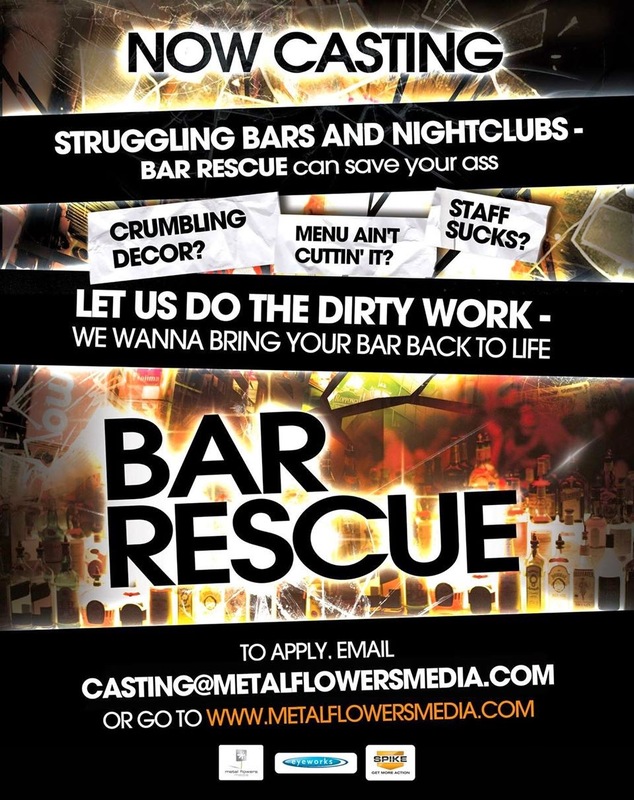 Metal Flowers Media is doing the casting for the next season and they are currently looking for bars in Tampa, Cleveland, Detroit, Minneapolis, St. Louis, and Oklahoma City. They usually pick the city first, and then find the bars, so if you are trying to get on the show and aren't in one of these cities, you are most likely out of luck. So the casting is all the want to change? Ok, TIMEOUT ! Don't get me wrong. I like the show but I too admit that the older episodes were far better. There are two major points that I think deserve more attention and discussion. My first point I want to bring up is that there doesn't seem to be any new dynamic on the episodes aside from "more drama" that's actually degrading the quality of the show. Why not show bars that actually followed Taffer's advice but are still struggling. Taffer should face new challenges and let's face it. I'm pretty sure that there are local bars all over the country where the owners watched the episodes and followed up on improvements but still got no reward for changing their ways. Ok, I'm sure they didn't do makeovers in 36 hours or less or for that matter name changes since they cost money and possibly legal hurdles depending upon the location and change(s) in question. Still, they could do all the basic cleaning and low cost updates and upgrades so that Taffer can present perhaps new solutions. There are places in this great nation where it's not easy setting up a new bar let alone competing with already competitors well established. Sure, if it's an old bar that's declining, then new competition will inevitably crush it assuming that the "sleeping giant" doesn't wake up but that's different. My second other point I want to bring up is training vs spoiling. Why is Taffer spoiling the bar with automatic this, automatic that gizmos that do nothing but basically allow owners, managers, and staff to go back to their old ways? Why not test them out a few weeks on their training and then reward them? Pick a Detroit bar. It would be cool to visit one of the rescued bars in person! My biggest complaint is as the show has gotten bigger (and by extension Taffer as well) they don't do bars in small towns in the middle of nowhere. It's obvious that to make production and Taffer's life easier they do a bunch of bars in one location and then move onto another greater metropolitan area. Some of the best episodes have been in the middle of the country nowhere near a major city. I think the only way the show can get back some of its early success is to go back to "rescuing" small town bars more regularly. The producers are stopping by our bar in the small town of Sandusky, OH to talk about possibly doing a Bar Rescue to our 80 year old family neighborhood bar. Sandusky is 1 hour west of Cleveland about 1.5 hrs from Detroit. Stay tuned.